Computational thinking is an analytical thinking skill that draws on concepts from computer science but is a fundamental skill useful for everyone (Wing). Computational thinking as a practice is central to all sciences and not just computer science. There is hardly any profession where computers and computational methods are not used. New disciplines have come up in the past decades or so due to the advancement in computational methods. Computational thinking concepts are used in other disciplines including biology, health, retail, transportation, history, journalism, finance, and archaeology. Students who can think computationally are better able to conceptualise, understand and use technology, helping them to be better prepared for the future. The National Research Council (NRC) (NRC ) has highlighted the importance of exposing students to computational thinking notions early in their school years and helping them to understand when and how to apply these essential skills. 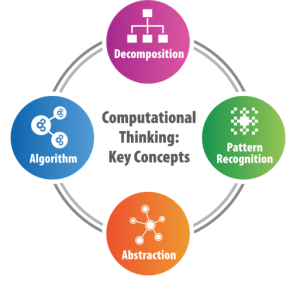 Computer Science Teachers Association (CSTA https://www.csteachers.org/) and the International Society for Technology in Education (ISTE https://www.iste.org/) have presented a computational thinking framework for K-12 schools in 2011 with core computational thinking concepts and capabilities, including data collection, data analysis, data representation, problem decomposition, abstraction, algorithms and procedures, automation, parallelization, and simulation (CACM ). Algorithms are central to both computer science and computational thinking. Algorithms underlie the most basic tasks everyone performs, from following a simple cooking recipe to providing complicated driving directions. There is a general misconception that algorithms are used only to solve mathematical problems and are not applicable in other disciplines whereas there are enough examples from daily lives that require us to use algorithms. For example, the steps involved in brushing teeth, getting ready for school, steps performed during a lab experiment etc. Understanding and articulating algorithms as a sequence of precise steps helps us develop an algorithm that can be understood by a human or a machine, in the latter case implemented by a computing program. Students can be exposed to the computational thinking concept of abstraction by creating models in physics (such as a model of the solar system). Abstraction helps students learn to strip away complexity and unnecessary detail to focus only on the important parts of the problem. A number of leading research, educational, and funding organizations have argued for the need to introduce K-12 students to these core constructs and practices. Why teach Maths in Computational Thinking curriculum? Do you agree that mathematics is required for every profession? Why? What does mathematics have that makes it a foundational skill for every profession? Apart from basic counting, it helps us think logically – we break down a problem and solve it one step at a time. More importantly, it teaches us “abstraction” which is an essential concept when dealing with complex problems. It can help develop our problem solving, critical thinking and reasoning abilities. These are the foundational skills required for Computer Science and computational thinking. So it is important to include these aspects of mathematics and relevant examples into computing curriculum. Unfortunately the current mathematics curriculum in schools does not do enough justice to developing these skills. So curricula teaching Computer Science or computational thinking include these aspects of mathematics. One of the unintended side effects might be that seeing and working on mathematics examples through fun and activity based learning, students will develop better and improved understanding of concepts and perhaps overcome fear of Maths! Children learn to solve puzzles, design algorithms, get to know better ways to sort things, identify patterns, know of hierarchy, plan things better, etc. If you observe, all these skills are useful in daily life too and not just in computing! Ask someone for directions to reach a landmark and you will realize that you need to ask a number of people before you reach the destination. Why is that so? It is because instructions provided are incomplete and confusing and we have not learnt to give precise and clear instructions. This avoids confusing Computer Science with programming or learning application software, makes the activities available to those children who do not have access to computers, and overcomes the hurdle of having to learn programming before being able to explore ideas and articulating solutions as algorithms. We want students to realize that they are capable of finding solutions to problems on their own, rather than being given a solution to apply to the problem. For example children play the game of Tic-Tac-Toe and then develop the rules of the game as well as winning positions. The focus of the CSpathshala curriculum is to work towards developing problem solving and computational thinking as foundational skills amongst students and train them to be creators & inventors of technology and not just users of technology! With Computational Thinking, you will see your children getting smarter day by day. We also encourage you to go through the material yourself and see the progression of topics across grades – it is available for free! National Research Council. Report of a Workshop on The Scope and Nature of Computational Thinking. The National Academies Press, Washington, D.C., 2010.